The Black and Decker lithium ion drill and project kit is one of the best black and Decker toolsets on our list. What makes this set special is that it comes with a 20V Lithium drill for a variety of home projects. The lithium and ion battery is always ready and can hold a charge for up to 18 months which makes it a great investment. The 11 position clutch prevents stripping and overdriving screws. This is the set I personally own and it allows me to get so much done. After two years, it looks as new as the day I purchased it so you know the drill is extremely durable. The Black and Decker combination accessory set is one of the best selling Black and Decker set on Amazons best seller list. It has 5 star reviews and customer continue to rave about its performance. Includes a variety of Drill Bits for wood, metal, plastic and masonry. The set comes with a portable hard storage case that you can organize all of your tools with and take them anywhere you like. This set has components that contain the ideal size to complete just about any project you can imagine without having to buy other sets by paying more money. 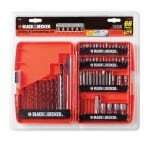 The Black and Decker drilling and screwdriver set come highly recommended on our Black and Decker Set list. This is a set with all the variety you need to accomplish any sort of task you could possibly handle or imagine. It provides drilling, screwing & much more variety for project completion. Included in this set are 66 pieces which mean you will not have to spend more money on buying more sets to accomplish jobs that this set cannot so you will save a lot of money. Lastly, you will get a lifetime warranty which means any defective tools are covered and will be replaced at any time if you keep your registration information. The Black and Decker max lithium ion drill kit with 100 accessories is one of my favourite Black and Decker sets. Its Lithium-ion battery is always ready and holds a charge up to 18 months. The 24-position clutch prevents stripping and overdriving screws which is huge when you are trying to be as efficient as possible. Includes 100-piece assortment of accessories ideal for all your needs for almost any job you need to complete. This drill is Ideal for drilling through or screwdriving in wood, metal, and plastic. You will not regret buying this set if you decide to go with it from this list. My friend personally uses it and it has become his favourite. Also very easy to carry around. The Black and Decker 12 volt max lithium drill and project kit is a fantastic set that Includes a 12V Lithium drill for a variety of home projects. The Lithium-Ion Battery is always Ready and holds a charge up to 18 months. The 11 position clutch prevents stripping and overdriving screws. It includes 56 hand tools and accessories which means you will be ready for any repairs that need to get done in your home. Lastly, you will get the famous Black and Decker guarantee that covers any defects your tools may come with. I always feel good when buying products with this kind of guarantees and you should always look for them before making any purchases. The Black and Decker 7.2 volt lithium ion drill and project kit is one of the unique sets on the market. What makes this set special is that it comes with a 20V Lithium drill for a variety of home projects. The lithium and ion battery is always ready and can hold a charge for up to 18 months which makes it a great investment. The 11 position clutch prevents stripping and overdriving screws. This is the set I personally own and it allows me to get so much done. After two years, it looks as new as the day I purchased it so you know the drill is extremely durable. The Black and Decker multi-project kit is one of the best multi-purpose Black and Decker sets on the market. You can fasten Or hang Window Boxes Drill large holes or run wiring Install new cabinet hardware. Also you will be able to Mount exterior house number or ornaments on stone or brick Install curtains, blinds Indoor, Outdoor drilling in wood, masonry, metal and plastic. You can basically accomplish any repair or enhancement jobs you are able to handle with this set and it will last you a lifetime. This fantastic kit includes assorted drill bits, spade bits and screwdriver bits, hex keys, nut drivers, drill bit gauge, and magnetic bit tip holder. The Black and Decker drilling and screw driving set include the most popular range of screw driving accessories on the market which means you will not need any other toolset. I can’t tell you how much money it will cost you in the future if your set is lacking certain kinds of tools. This can be used with power tools or even by hand if you don’t have a power drill in your home which is quite normal for people that don’t fix things at home much often. The set includes a handy organizing case so you tools are always where they belong and are easy to take with you wherever you need to go. The Black and Decker drill and screwdriver set is last on our list of best black and Decker sets. Don’t underestimate it because if its low position. It is priced well and has 4-star ratings on Amazon because customer seem to love it. You will not find another bargain like this on any other list for a set that includes 195 pieces that can be used for almost every type of repair.